This is not one of those all-too-common sad stories about the beloved local independent bookstore going under. The owners of Diesel Bookstore have a plan to sell their store to a trusted employee. All he needs is some help from about 200 book worms willing to make an investment in the East Bay literary scene. Brad Johnson, a manager at the bookstore in the Rockridge neighborhood of Oakland, is hoping to raise $200,000 in increments of $1,000 or more to buy the store from John Evans and Alison Reid. "It started with an off-hand comment at a meeting. We were talking about the future, and I said, 'What would be perfect would be if you took over the store,'" said Reid, who co-founded the shop in Emeryville in 1989. "Brad went away, came back and said, 'Are you serious?' And we realized I was." For a minimum investment of $1,000, investors can set their own interest rate from 1.5 to 4%, and get an intangible benefit -- a sense of ownership in a community institution, Johnson said. He plans to rename the store East Bay Booksellers. Reid and Evans will still own two bookstores in Larkspur and Southern California. Johnson said he discovered his love of selling books almost by accident when he started working at Diesel four years ago. The job became his passion. Lately, he learned the inner workings of the store and its finances. When the chance to own the store presented itself, he jumped. "The obvious thing came up -- not having money. If you work in the book business you don't. It's just a basic living wage," Reid explained. They considered crowdfunding, but since Diesel is an established business, not a start-up or non-profit, it didn't feel right. So Johnson decided to try a community lending model. "The store is great situation. Sales are up, and we project them to continue that way. It's a great time to experiment with this," said Johnson. "The only thing lacking is $200,000." Johnson said he chose a $1,000 floor to keep repayment plans simple. He plans to repay each loan over 5 years, after the first year of no payments. Greenlight Books in Brooklyn recently used a similar model to open a second store. Riffraff, a pub-bookstore in Providence, R.I., hopes to raise enough money from local investors to open soon. Johnson has 10 investors so far. 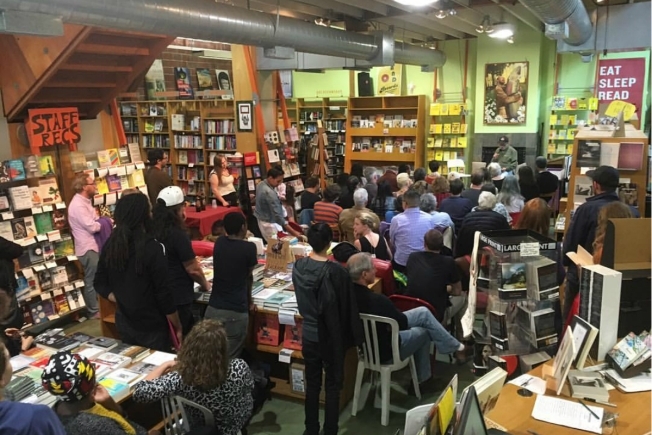 Investors mean "success, robust sales, and general enthusiasm for an independent bookstore in East Bay." The store will have "a new vision with the same values," Johnson said. "I have a more literary bent. Our values are closely aligned. It will be essentially the same store with the same staff." Johnson is optimistic about the future of independent bookstores. While some have closed, especially in the Bay Area where rents are steep, the number of stores operating across the country is up 27 percent since 2009, according to the American Booksellers Association. "You need a good location, a walkable area with good mass transit, and shoppers who support local businesses," he said. Readers buy at Diesel over Amazon ("It's like saying Voldemort," Johnson joked.) for their hand-selected suggestions, literary culture and physical presence. "Increasingly, and here in the Bay Area, people get that." Johnson is hosting an informational meeting for potential investors on Sunday, November 20, after the stores annual customer appreciation pie party, which starts at 1pm. If the deal doesn't attract enough investors, Diesel will stay open, and be a part of the literary community and the Rockridge neighborhood, Reid said. The lending program is just a way for a handful of dedicated readers to have an even bigger part of the store.